My favorite turquoise frame with a print from Decoylab. A plastic deer that I bought for a couple dollars at CVS a few years ago. I love this darn thing. A wooden "W" that was a gift from a friend. 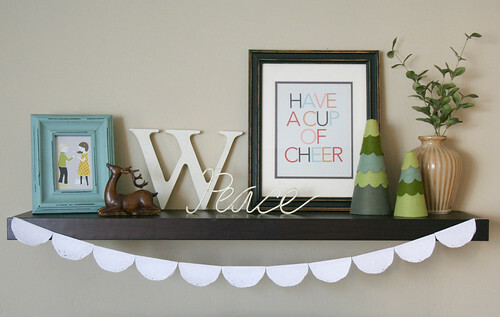 A frame featuring a cheerful print from Show & Tell (by the lovely Summer Harms!). 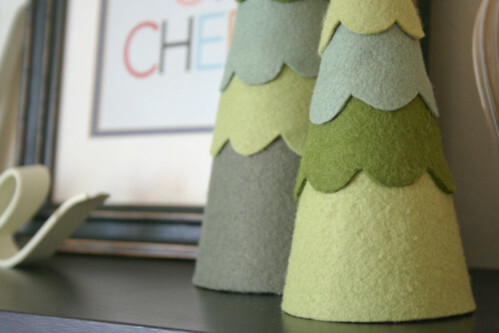 Felt trees that I made a few days ago on a whim. A vase and some fake leafy stems. 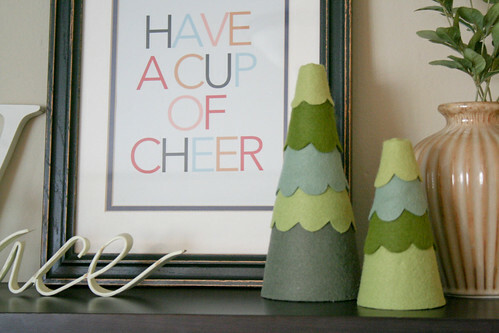 I'd love to give you a tutorial on these felt trees, but I know there are a bunch of them already floating around the internet (here's something similar from Danielle Thompson!). I ended up just using bit of extra felt and some hot glue and a couple styrofoam tree forms from Michaels, figuring it out as I went along. I'm sure it would have been much easier with a pattern, but I'm stubborn. Sometimes I get in a weird mood and sit down for an hour with a random idea and absolutely no direction. This time, I think it worked out quite well! I have nothing but fond emotions for these little trees. So, there you have it. A cheerful shelf for one of my favorite months. I'd probably love it more if YOU designed mine for me, lol... but it'll be good for me to stretch my creativity beyond a computer screen. i love everything about this. you seriously have great style. yaaaaay! this makes me so happy. seeing it in a sweet home, all nestled in. pretty! i tried to make some foam tree thingys, buuuuuuut...., yeah. not so much. i might just decompose them & try your version instead ;P merry christmas, friend! How funny, I recently started some felt projects and had no idea where to buy the good kind, and then today you and another of my favorite craft bloggers linked to the same place! Why is it those floating shelfs are such a pain!! !- HA it looks awesome!! Only you would stick a bluer-green felt on a tree that perfectly matches a color in the print next to it. Goddess powers at work, yo. Your garland is adorable! I've been thinking about making some for myself. I never thought about using doilies. Thanks for the idea! 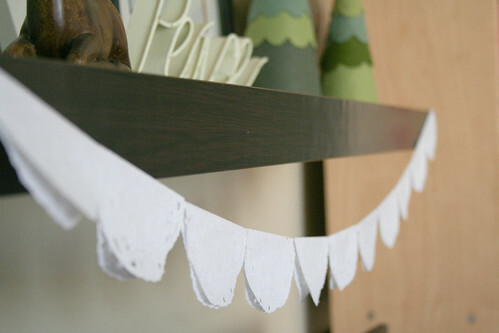 I love this floating shelf! And I'm totally with you on those doily garlands. They're so easy to make and they turn out so simple and pretty! The definitely add some umph to one's shelves, windows, and doorways! I also wanted to thank you for that email/blog comment you left awhile back. It was such a nice surprise to hear from you!